The ABC’s Ali Clarke jumped 1.9 percentage points in the third survey of the year to overtake former leader Mix 102.3 and establish a significant lead over talk rival FIVEaa. With 15.6 per cent of audience share – and a steady trend upwards this year – Clarke appears to be heading towards the kinds of numbers enjoyed by her predecessors Matthew Abraham and David Bevan in their long dominance of the breakfast shift. Clarke overtook previous leaders Jodie Oddy and Mark Soderstrom at Mix, who fell slightly to 14.3 per cent. In third place, FIVEaa’s David Penberthy and Will Goodings increased their share from 12.2 to 12.6 per cent. Clarke led the way in a strong survey for ABC Radio Adelaide, which jumped to second place overall, thanks to a strong increase in the 55-64 and 40-54 age groups. Overall, Mix retains its long-held mantle as Adelaide’s leading station, despite a drop of just under 1 percentage point, followed by ABC Radio Adelaide, Triple M, FIVEaa, Nova and Cruise. 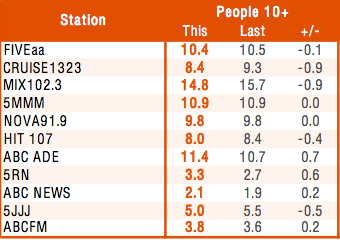 ABC stations were the only Adelaide stations to increase their share in the third survey for the year. Mix lost share in its morning and afternoon shifts, but remains the clear leader in both. 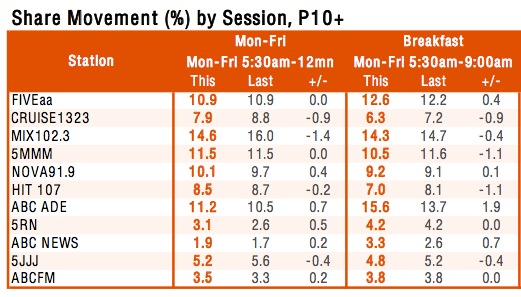 Nova overtook Mix to take the lead in Drive, while FIVEaa is dominant from 7pm to midnight – a shift taken by Jon Blake in the first hour, and veteran Jeremy Cordeaux thereafter. Disclosure: David Washington is an occasional unpaid guest on Ali Clarke’s program.